About Product : Music, they say, is the silence between two notes. 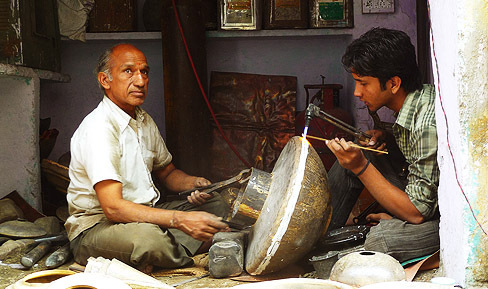 The silence becomes even more omnipresent as it makes rare appearances between the constant sounds of metal being beaten in the ‘Thatheron ki gali’, Jaipur. 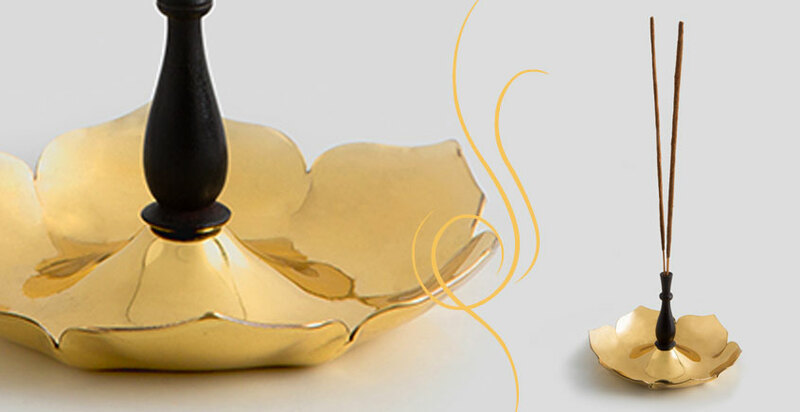 The contemporary designs of these beautiful objects in wood, brass, copper, stone emanate a feeling of still movement. These are little joys of life with a crafty twist. Music, they say, is the silence between two notes. The silence becomes even more omnipresent as it makes rare appearances between the constant sounds of metal being beaten in the ‘Thatheron ki gali’. 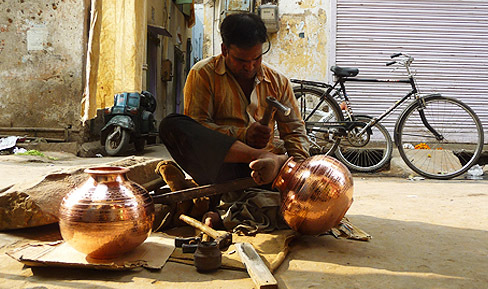 This street in Jaipur is a home to utensil makers, locally known as the ‘Thatherey’ and is as old as the city itself. 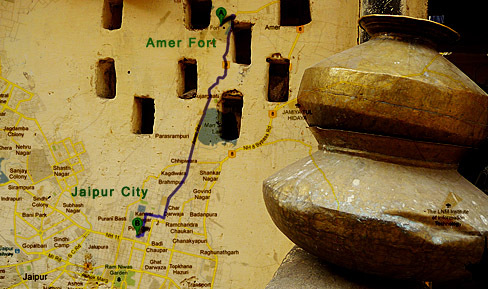 In 1727, Jaipur was established as a new capital by Sawai Jai Singh II (1700-1743) and artisans, craftsmen & merchants were invited to institute centers of trade in Jaipur. As a result, the ‘Thatherey’ who had all along lived with the Maharajas in Amer Fort, came down to settle in Jaipur. Of the 200 families that had inhabited these hallowed streets back then, only 80 remain today. But unlike other artisans who were beckoned for their knowledge of craft, the ‘Thatherey’ artisans were summoned because they were absolutely necessary for their supply of utilitarian objects in the newly springing city. Metal vessels became a ubiquitous household necessity in the primordial times as elements of storing water and other edible fluids, for kneading the flour dough and other common chores. 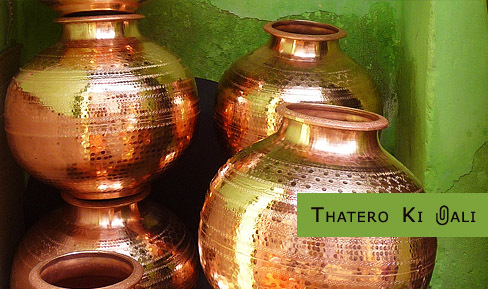 The belief that is concurred upon even in these days of steel and aluminum is that food and beverages stored in copper and brass utensils were rendered preserved, whilst the mineral content of the utensil lenthealth benefits to the consumers.Premchandji, a veteran craftsman from the street recalls that the bygone era hadartisans make water vessels - lotas, large serving plates – paraat, paani ka ghada, mandir ka kalash. He continues to narrate that huge silver water vessels were created for kings travelling away to foreign lands. 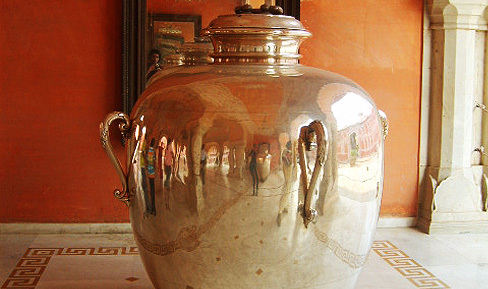 One such vessel is housed in Jaipur’s city palace today. 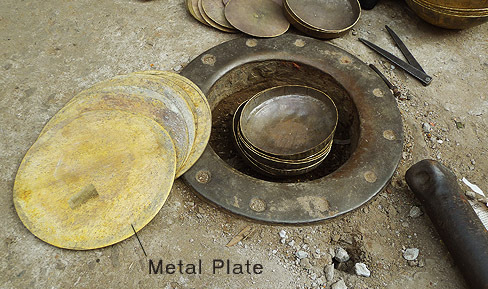 Square or circular pieces are cut out of the flat metal sheets – Brass (70% Cu + 30% Zn) and Copper. The gauge of these sheets is determined by the vessel they are intended for. 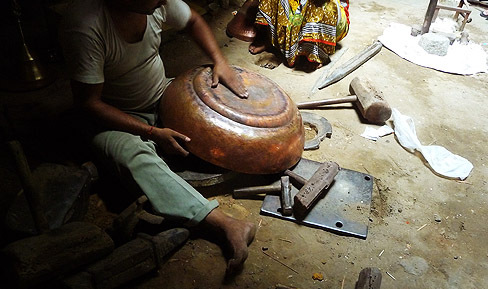 These disks are beaten up using a ‘Khachara’ or a mallet with varying weights and a wooden support. The wooden support of this tool is of indispensable importance as it equips the artisan with greater control for making dents, unlike a less preferred metal stem that might completely butcher the metal. The metal is beaten till it naturally bends along a concave or convex curve as required. Another important tool that assists this process is the ‘Bangad’ or a solid metal ring anchored in sand. This becomes the seat for the metal as it undergoes controlled bending. 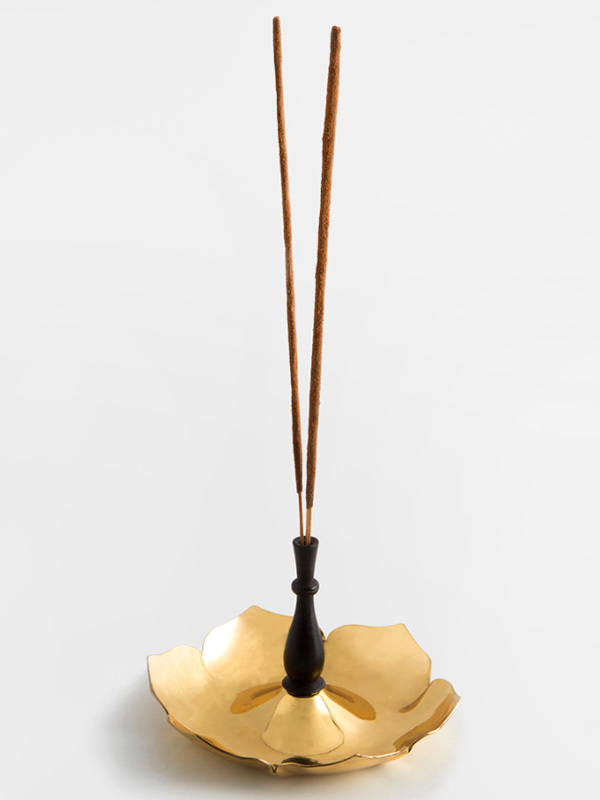 A sold iron rod bent at the tip, called ‘Megh khushiya’ further contribute to the process of handling the utensil while it is being textured. The desired utensil is always designed as a combination of parts which are welded into a unanimous whole. 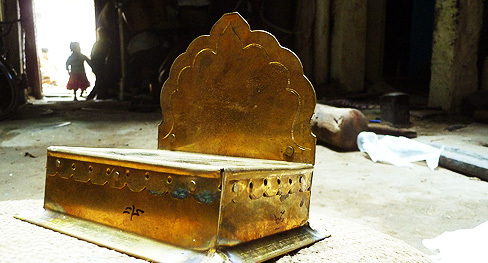 In former days blacksmiths used a joinery technique which involves creation of a subtle ridge which camouflages the welding on further beating and finishing. According to this procedure, the pieces of metal were placed in a furnace made of mud (bhatti) and heated to high temperatures. The metal thus acquired would be more malleable and merge into one another to form a single mass as against the gas welding used in the present times. Eventually, the obtained products are given an acid wash until they appear to shine like gold. These containers retain the impression of the hammer strokes that mold them, which in turn accentuate their forms and textures. Over a period of time the craftsmen have designed variously shaped hammers that render different patterns on the body of the metal vessel. As a matter of fact, the local craftsmen believe these multiple miniature dents make the sheet metal stronger and prevent further surface manipulation. Today the craftsmen are mostly approached for creation of Singhasans (royal seats) for idols, Chatris (umbrellas) and bells for temples. While light weight and low cost steel and aluminum utensils have largely replaced brass from the modern day kitchen, there still exists a group of dedicated admirers who appreciate them for their aesthetic quality and health benefits. Music, they say, is the silence between two notes. The silence becomes even more omnipresent as it m..
Music, they say, is the silence between two notes. The silence becomes even more omnipresent as ..